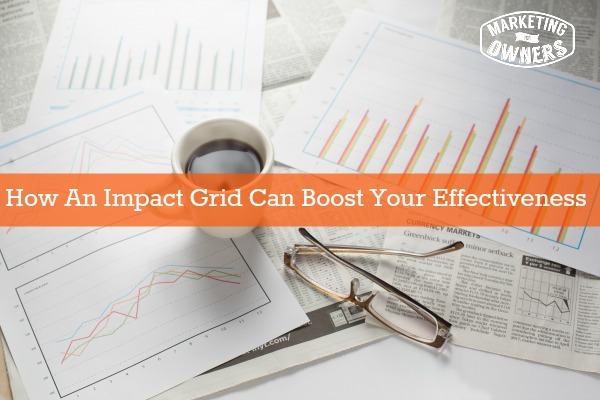 What is an impact grid, you ask, and how is it going to help me to be effective? Okay — let’s recap real quick before we dive into this new topic. Remember I talked about being busy, being productive, being effective? Being effective is better than being productive. So now, let’s talk about that impact grid. We are very busy people with a lot to do. So, how do we decide which tasks to do and how to be more effective in those tasks? Yesterday, I explained how to break down projects in too smaller bite sized tasks. Bite sized chunks help us to get things done one step at a time and move along the line to get the whole thing done without the overwhelm. Yes, this goes hand in hand because you’ve probably got quite a long list of things to do and you have no idea which one to do first. My advice is not try to do all the things at once Don’t think you can get ten projects started and then only try to do them bits and pieces here and there. I can’t explain why it won’t work, but believe me it doesn’t. In fact, most thinking goes to saying this — do one single project and when it’s done, move on to the next! Of course I ignore that advice myself, even though I think that I agree with it but don’t listen to me except for everything else. So what is an impact grid? It’s very simple really. An impact grid is a grid to help you figure out which tasks should be completed first. Star with a list that has three columns. The first column is the task, it’s the item. The second column is the impact, and the third column is the ease. The impact is the what it will do for your business. The task is how will you get there, and the third is the ease — how easy it is to do? How cheap it is to do if you’re not doing it at all you know that type of easy. You can find a really great example of an Impact Grid here. In the task column you would write down the tasks. For instance, one of our jobs that we have going on right now is to create a free course. It’s a seventeen part free course on how to set up an effective working website for less than hundred dollars. Another task that we are having created is an image style guide full of helpful tips and tricks. Another task that I have is instructing someone else on my team to do some of my work that I used to do or should have done by the way. Another task that I need to get accomplished is getting our content calender scheduled well ahead, so it’s not always hand to mouth. As you can see this is a very lengthy list of tasks that I have to get accomplished. By putting them in an impact grid, I can scale or rank them from zero to ten, ten being the highest of their likely impact on the business. Let’s take the image style guide for example. This is not going to have a great impact on the business. It is a freebie that we are going to be offering, so that would be down to three or a number with less importance. Now, the free course modules — they will have a high impact because that’s going to be a massive lead generator. So that may have an eight or a nine. The new landing page that we are creating will also have a high impact, and funny enough the guide that you get from that landing page would have an equal impact. They’re both the same but they would be high on the scale. Having someone on my team take over some of my tasks possibly not so urgent because I’m managing it at the moment. 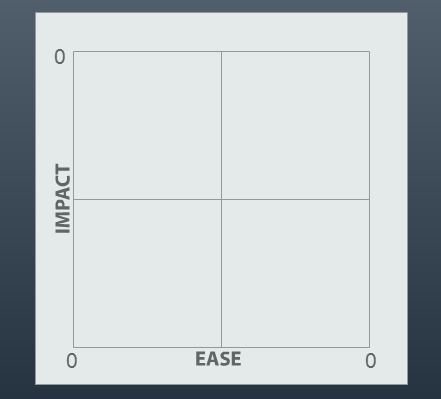 That is the gist of the task portion of an impact grid. Then we move over to the ease, the free course modules. That’s not easy. It’s going to take a month of solid work so we might give that one a four on our scale. Now the guide PDF has the actual content already written so that is just a case of outsourcing it to our designer who will put it together and then upload. That is very easy. It doesn’t cost us much so we’re going to put that down at something like an eight. Our new landing page was outsourced to our wordpress specialist. This will cost slightly more than having the other guide so this is going to make the ease of this task slightly below maybe a seven but it is a simple case of saying ‘please do that’. What do I do once I get all the information gathered? Now the next thing that you are going to do is draw a grid, just like you used to do in school. Draw a vertical axis and a horizontal axis. On the vertical axis, you are going to write “impact” on that line. Write in numbers from zero to 10 up a scale. On the horizontal axis you’re going to write “ease” and you’re going to write zero to ten from zero being the bit where those two cross where they meet. Once you’ve don that, you are going to add in those tasks. Give each one a number or a, b, c something like that and you’re going to match where they come up with seven on one axis, nine on the other, four on one, eight on the other etc. And you’re going to put little dots. The next thing is, at the five, go across on the horizontal line and where you see the five, look at the vertical line straight up from the five and then go to the vertical impact line on number five and draw a horizontal line. So you’ve split your grid into four segments. Honestly, once you see the picture, this really does make sense and this is a piece of cake. Now look at those tasks that you’ve written there. How many of them are in the top section from five to ten and five to ten the top quarter furthest away from the bit where the lines join? Those are collectively the easiest ones to get done and have the most impact. Those are the tasks you need to be doing now. In fact, some of these other tasks you might not get around to ever because you might look at them and say they don’t actually have much impact. Are they really necessary? This is genius. I didn’t invent it. It works! It will amazingly change your effectiveness and gets stuff done. Today I want to tell you about a guy who is absolutely brilliant on Twitter. His name is Dharmesh Shah. 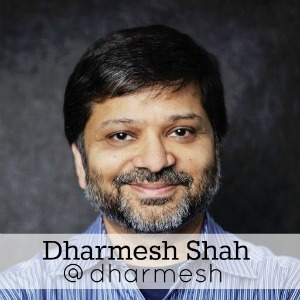 You can find him on Twitter at @Dharmesh. Dharnesh Shaw is one of the two founders of Hubspot. They have a conference that they do called Inbound Marketing. Follow him. Follow the links. Read his information. Emulate what he does. It will further your business. Will you be making your impact grid this weekend?